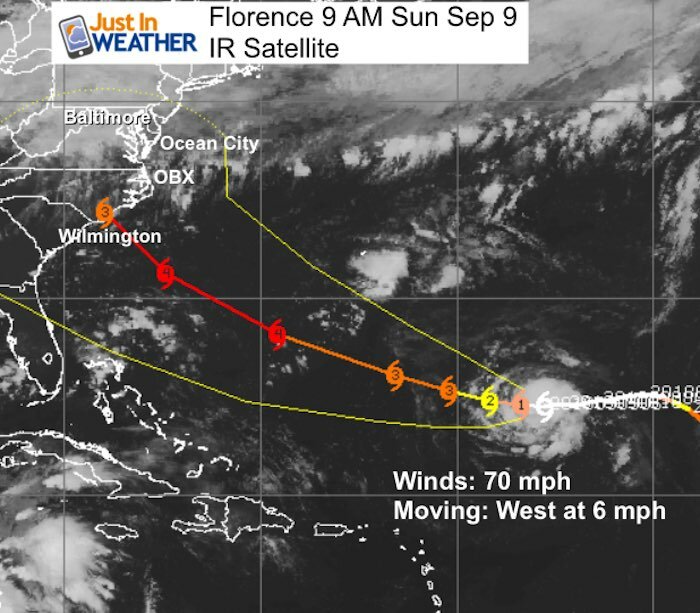 As of this morning, Florence was still a tropical storm with 70 mph winds. It is expected to become a hurricane toady, and then on the road to steady growth and strengthening. 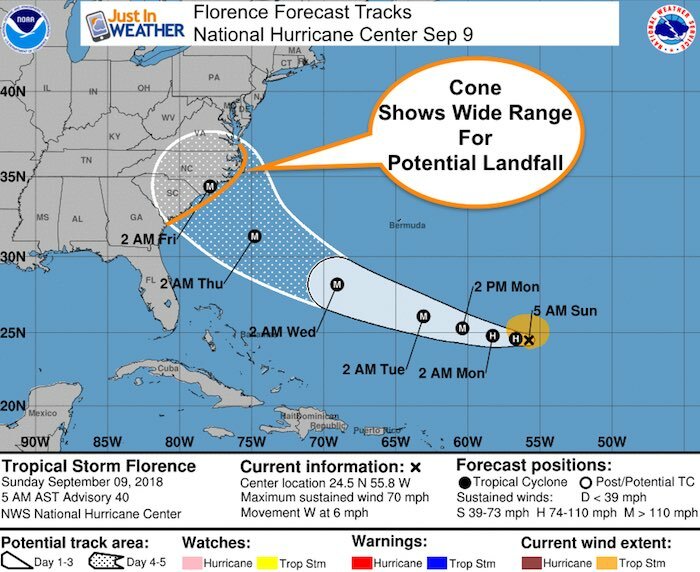 The track puts it over warmer water with less wind sheer than may allow a Category 3 or 4 storm before approaching the North Carolina Coastline. There is still a large cone where this may actually end up. 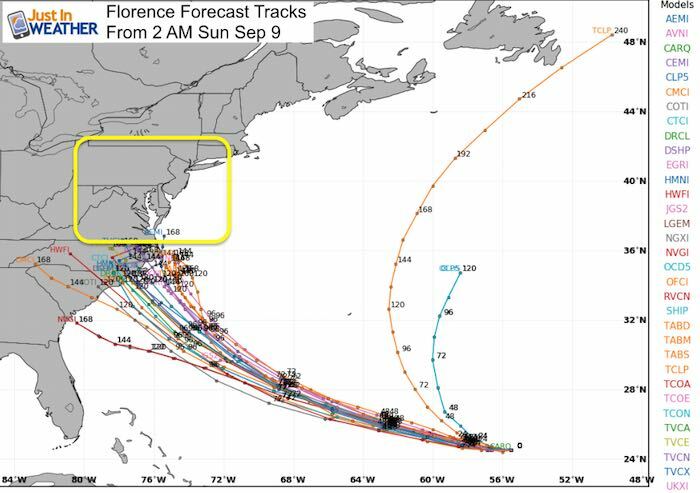 But the important note this morning is there has been more consistency for track and now time to be serious about the most likely places to get hit. Please read all of this info as it is important before addressing the most popular question I have been getting: While This Impact Us. I answer that below. 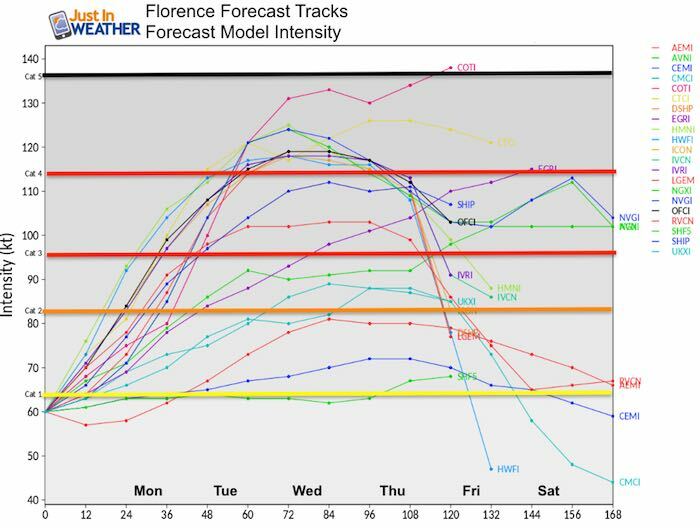 There is a wide spread but most modeling supports a Category 3 or stronger storm by Tuesday. 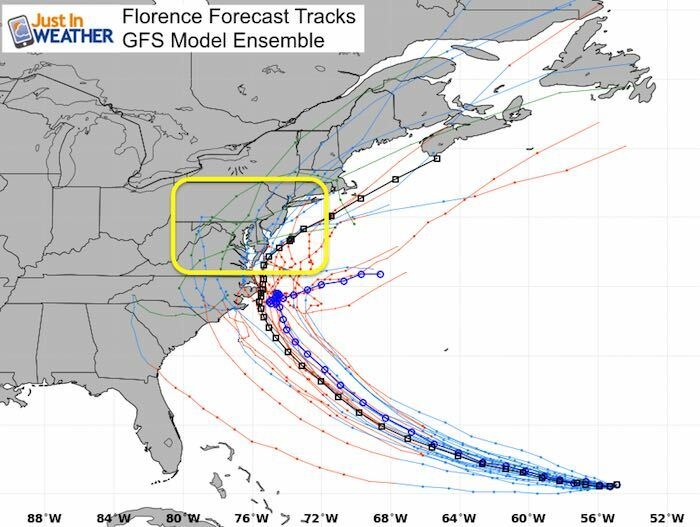 The latest forecast model spread does seem to focus on North Carolina for landfall, but there is still a dilemma. 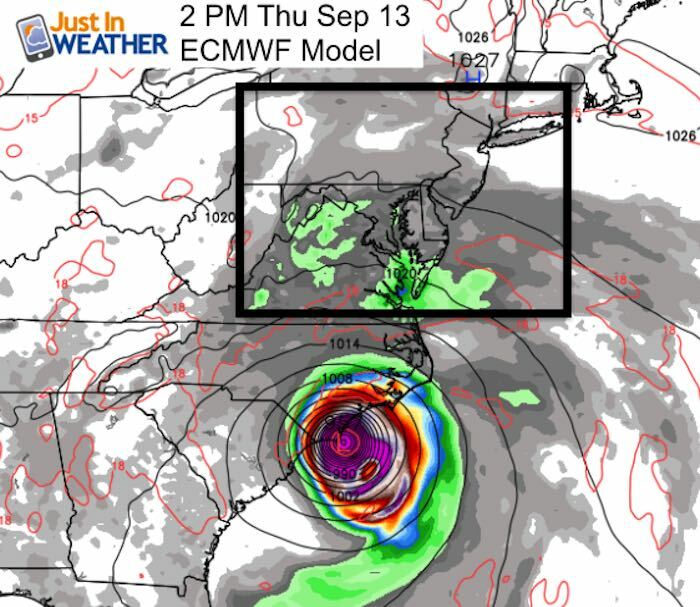 Compare the ECMWF (European) and GFS (American) Models that are a a full day off for potential landfall. That relates to forward speed and can in turn result in a different solution that includes landfall and potential to stall. These plots are from the same model that puts out numerous solutions. These ‘member’ plots are then essentially averaged in the most likely outcome that most meteorologists will pass along to you the public. 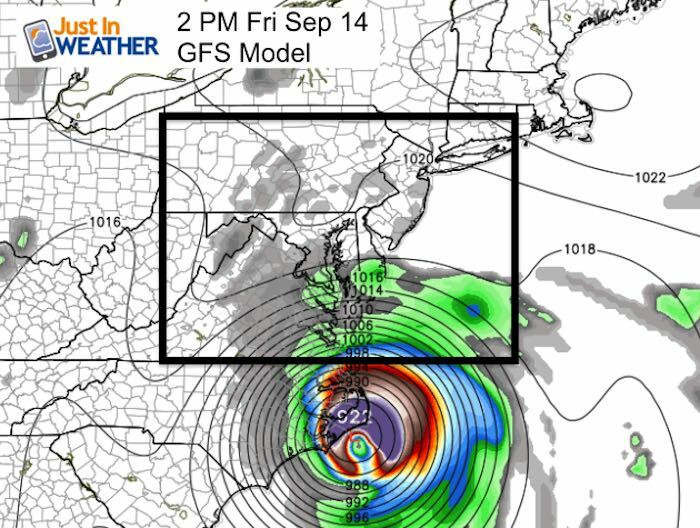 The GFS Model also shows a curve with the core just grazing North Carolina by Cape Hatteras… But also a solution that stalls is. See the animation plot below that track map. This rainfall outlook does include some of the rain from today. 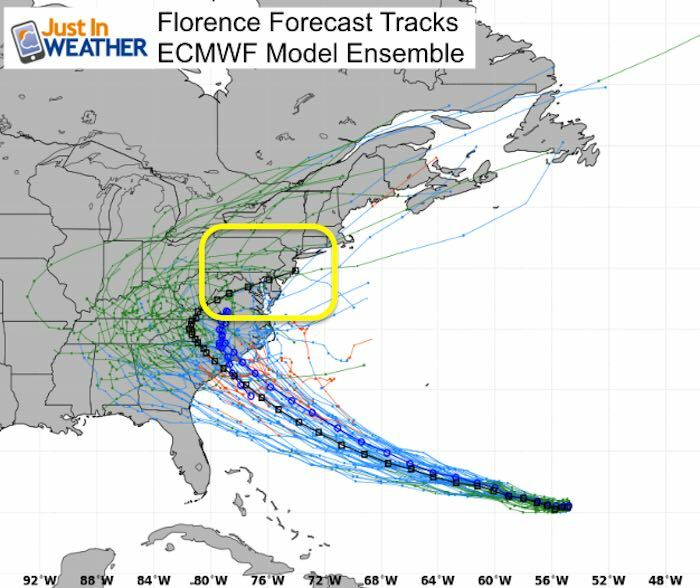 I have highlighted the core of Florence potential rain… Depending on if and where it could stall… That could blow the rain totals up big time! So this is just a guide, but not a promise. That is the biggest question I get and it is still too early to say. 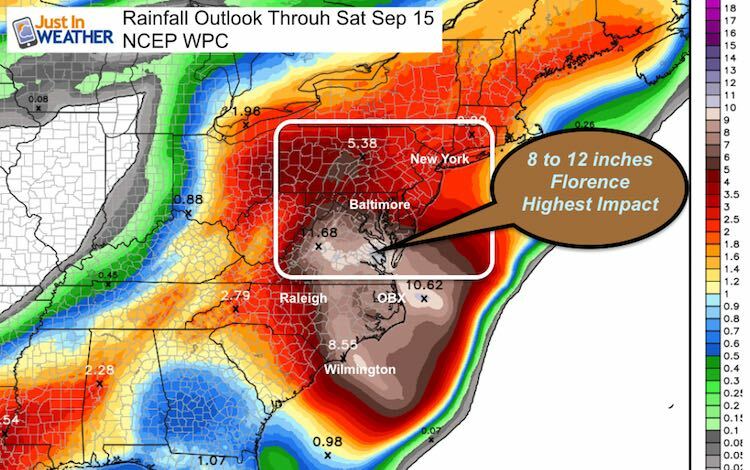 The main reason is that the timing of the storm can determine if it will wander up the coast and slam us with flooding rain or stall to our south. The timing is contingent on other features that can catch up and help steer the storm at that time.